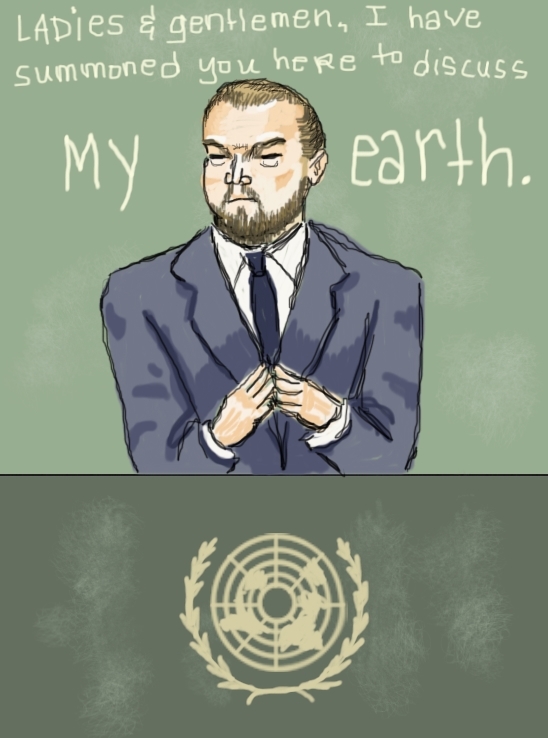 Several months ago, the United Nations appointed the glossy-coated man-thing, Leonardo DiCaprio, to be an official Messenger of Peace to the world. He will focus his valuable time and energy to requesting that the human inhabitants of his planet, Earth, pay better attention to impending environmental doom. He goes so far to expect that we get off our slack ponies and actually prevent it from happening! You and I might hope that the human race rises to the challenge, but important men such as Mr. DiCaprio, former child star, have the drive and the money to actually make it so. As stated, this all went down last year, and I think I was aware of it, but did not see video footage of it until today. This is my fault for not subscribing to the mailing lists belonging to the UN, or the <3 Oh, Leo <3 Fan Club. Upon seeing just the thumbnail image of the video, however, I have a very important observation to make. I think, maybe, (and I hope this does not throw DiCaprio into a vengeful wrath) he should work on his physical appearance. Standing at the podium, addressing world leaders, he did not look like a celebrity gadabout. He looked like a hobo-chic fashion magnate villain from a James Bond film. Early in the film, though: just as he is poised in a prominent position of power and we don’t yet know that there is a secret laboratory on his mega-yacht full of stick figure lingerie models. 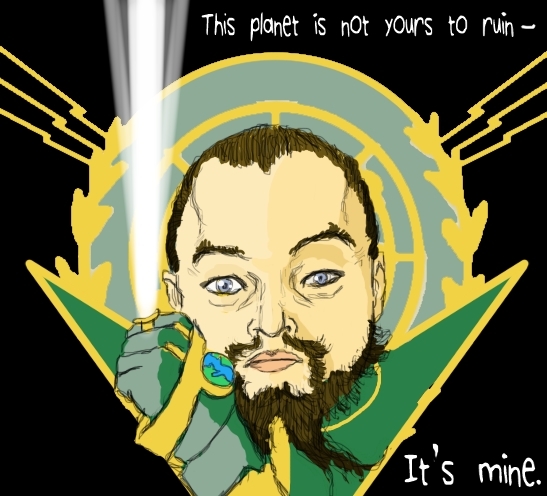 Leonardo Wilhelm DiCaprio is a perfect villain name. He is working his way up the ladder of world organization politics. His aging bachelor antics make him the envy of many. He has his own island − an island that he plans to allow other environmentally-friendly super-rich peers the opportunity to live on in a very opulent-yet-green style. I have a feeling that maybe in this Bond Movie, the villain might be a tormented, misunderstood man who believes he is being a new Captain Planet. Right now, we are at the beginning of his transformation (that facial hair can’t be anything other than a cocoon forming). We are in the part of the movie that is showing us the back story of his character. Only because this is real for us and not a movie, we are seeing it in real-time. We are aware! We’re onto you, Leonardo DiCaprio! Please, use your power for Good! Don’t become a twisted villain! Secret Agent 007 has never been known to lose!